It was a dark and stormy night… oh wait, that’s a different story… It was a dazzling sunrise when I woke up at 5am so I couldn’t wait; I had to get in the kayak. I gave my sweet snoring man a quick kiss and off I went. 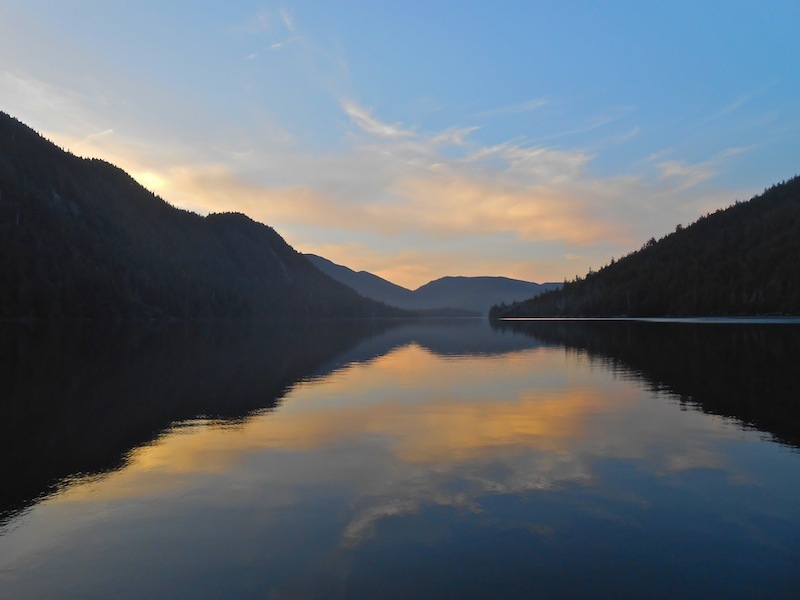 The mist on Hessa Inlet was rising into the sun’s rays coming over the mountain and the water was glass. 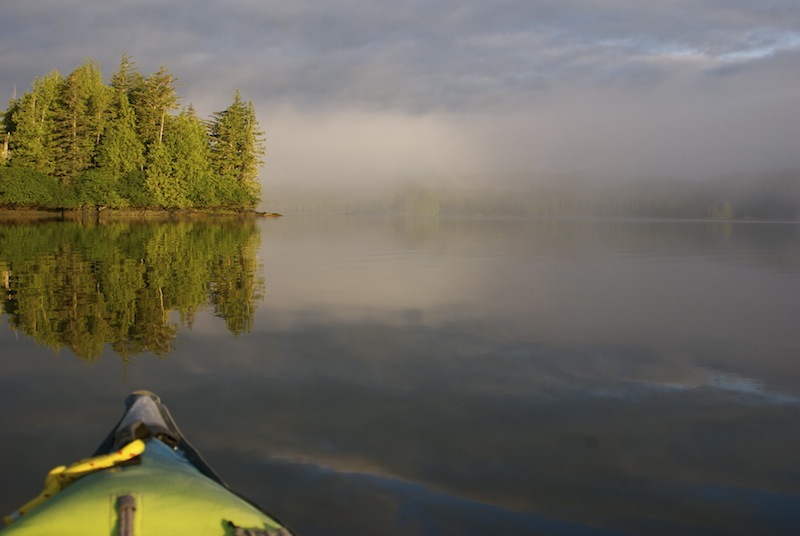 We had seen a bear on the beach just off our stern the night before where we were anchored, so I paddled over to shore to see if I could hear or see any signs of an early morning visitor. No luck, but lots of great reflections and the eerie sound of loons calling in the distance…very cool. I paddled around the various little notches along the shore watching thousands of jellyfish undulating in the clear water (the jellyfish backstroke), listening to fish jumping and birds calling. 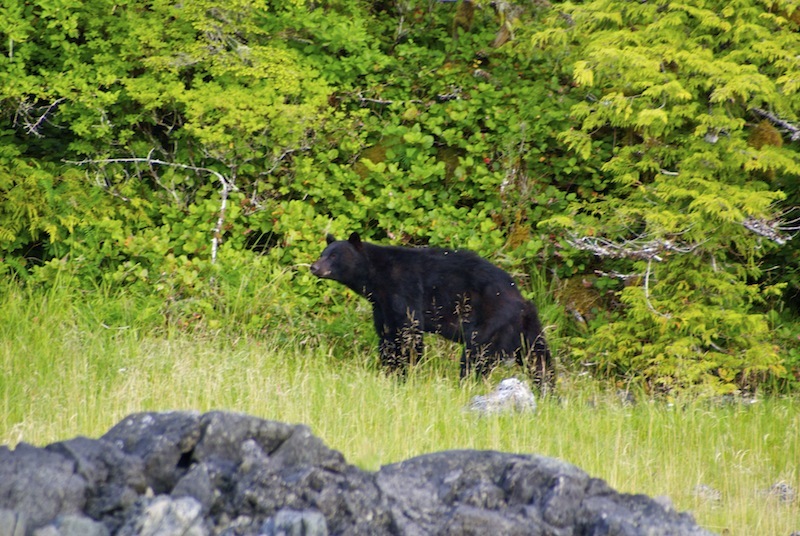 Then I went over to an area with a large grassy beach and there was our resident black bear crashing his way through the underbrush as he ate blueberries to his hearts content. I was able to paddle pretty close, though it was so shallow that it made me a little nervous because he could easily get to me if he decided that he wanted a bit more substantial brekkie! I sat there for quite awhile just watching and listening – it was breathtaking. After kayaking for a couple hours I went back to Happy Dance where Marty and a hot cup of coffee were waiting! We love to have morning coffee on the verandah (a.k.a., the cockpit), while watching the world wake up. On this particular morning we saw two sets of black tail Sitka deer, one mom and a fawn, then another mom with two fawns! It was kind of surprising to see them wandering around on the rocky beach, but they were just munching on the grass and enjoying the morning. The plan was to get underway by 1000am to catch the outgoing tide through the narrow entrance, so after breakfast we had to get the boat ship shape and ready to go. This includes our standard checklist; check the oil, check the water strainer, close the thru hulls in the heads, put the dishes away, close all the hatches and portholes, stow the computers, put on the correct layers for the day, put out water bottles in the cockpit, make sandwiches (if it’s a long passage), and finally, weigh anchor! We now have eight boats in the flotilla, so it’s a sight to see as we all line up to pass through these narrow channels. On this day as soon as we were all through the narrows and back into open water we started hearing reports of whales and sea otters from the other boats. There was a large bait ball in the middle of the islands that we were winding our way through, so we all stopped and floated for awhile as we watched 5 or 6 humpbacks feeding on the bait ball. There was a little bit of bubble net action going on and then a couple of eagles flew over to join in as well. It’s exciting to watch all the action when food is available (reminded me of Kyle’s 10-yr old birthday party when the 8-layer cake was brought out!). After our whale-watching excursion, we headed off into deeper water to find some good fishing spots. We have learned to find a high spot on the chart and then situate the boat on the downslope where fish seem to like to hang out. 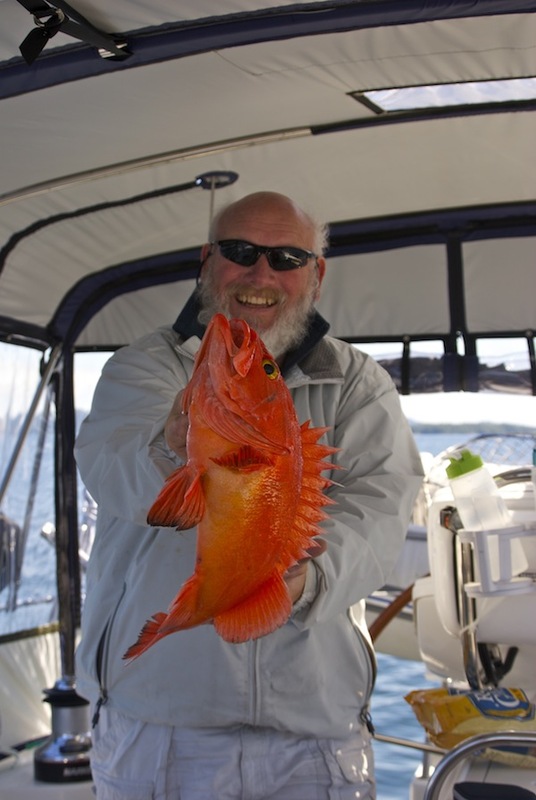 Marty was rockfish man, and every time he put his hook in the water he hauled up a good-sized rockfish. We threw most of them back, because we’ve already gotten so that we wait for a big one now! We didn’t have long to wait as Marty reeled in a beautiful red snapper (also called a goldeneye or Sebastes ruberrimus!). 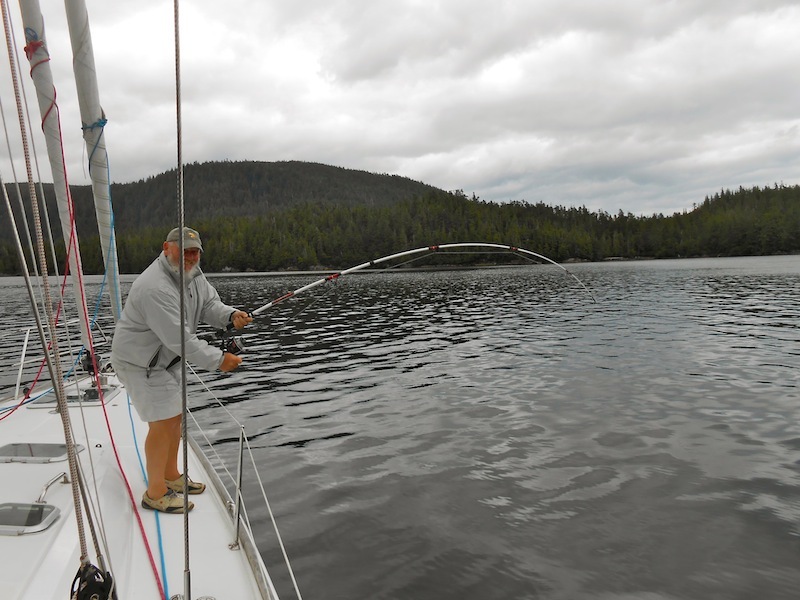 I caught a couple of smaller sea bass, so we decided to switch tactics and try for a salmon. We changed our lure and started trolling. No luck, and I think we still have lots to learn because the other boats were catching salmon right and left! After leaving the fishing grounds we spent a few hours motoring into the wind as we worked our way north in Cordova Bay toward Kasook Inlet. 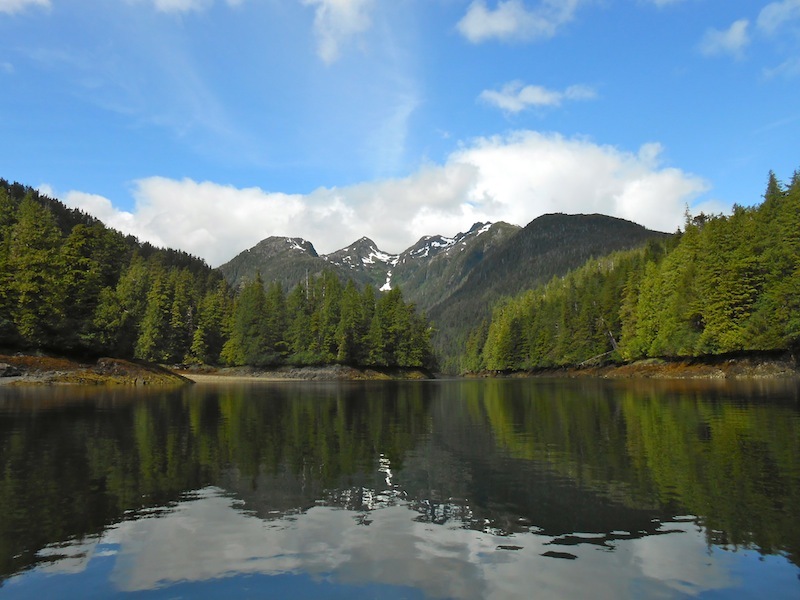 Cordova Bay opens to the SW to Dixon Entrance and the Pacific, with majestic rocky peaks on the mountains on either side of the channel – stunning! 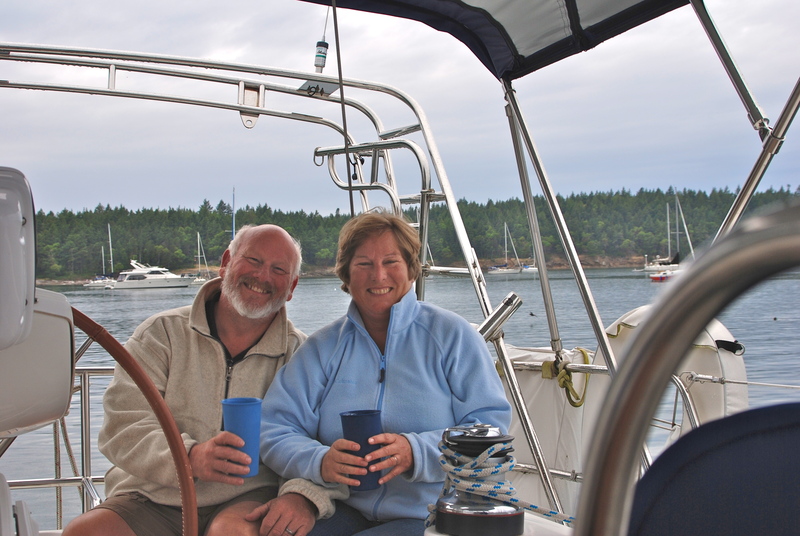 Once we arrived in Kasook Inlet we did our normal anchoring routine, circling the spot we’d chosen, to make sure there weren’t any surprises (a.k.a. shallow spots), and then making sure the anchor is set and then sitting and watching the swing for a bit until we are comfortable. Once all the boats had their hooks down it was time to set up a fire pit on the beach. The guys all dinghy-ed to shore to build a rock pit surrounded on three sides with logs and rocks so we could smoke all the salmon that were caught (Ruby Slippers’ crew caught 10!). Pretty soon the fire was going, log tables and log benches were arranged, and voila – a fish camp! The next day was beautiful sunshine, so after we all collected cedar and alder branches, and the fish was hung across the pit, it was time to play in the kayaks or walk the beaches. The salmon smoked all day and by evening we had quite the dinner ready to go. Smoked salmon fettuccini, three types of salads, fresh biscuits, and lots of good company, all followed by S’mores! What could be better? With a later departure time scheduled the next day, we had time to kayak and happened to come upon another bear walking along the beach, watching us just as much as we were watching him. A perfect ending/beginning to another perfect day in paradise!! Nice snapper Marty! Sue, you do such a wonderful job writing this blog, providing great pictures and humor chronicling your great adventures. Thanks so much for sharing you guys! 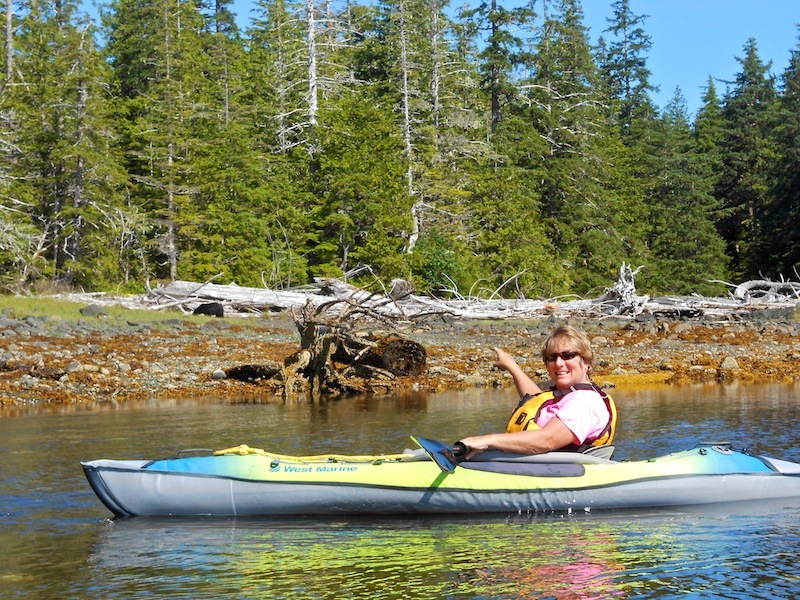 I am enjoying your blog as you visit many of the same places that my wife and I visited back in 1998 when we took our boat up the inside passage. One place I would recommend you stop is Anan Bear Wildlife Observatory which is close to Wrangel. Have fun! The red snapper was beautiful. Acturally took me back when I saw the picture. 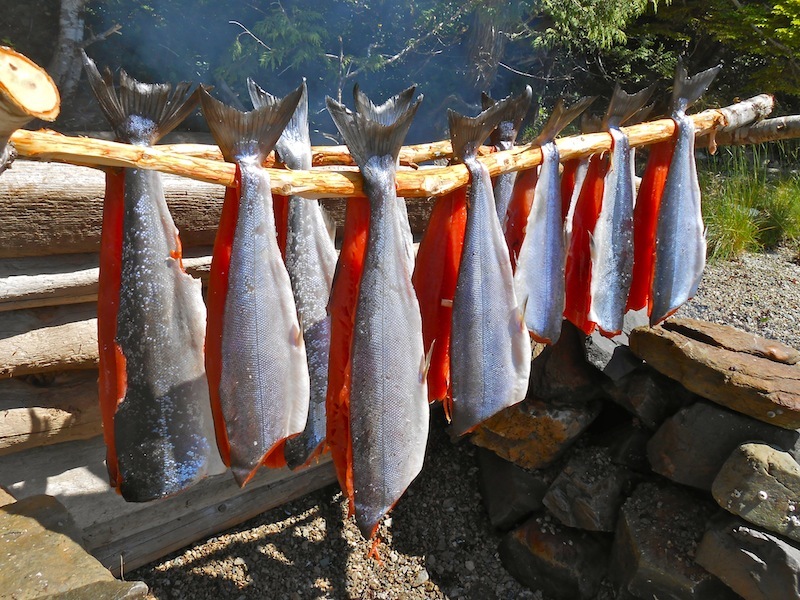 All the salmon smoking was a great sight. having had smoked salmon, I know it was more than delicious, being so fresh! you two are having a wonderful experience, envied by all. Love your writing. Keep Safe. Great to hear from you – hope all is well in SoCal!! We are constantly pinching ourselves to see if all this is a dream….and it IS…a dream come true..ha. Love to you – we’ll see you in a couple months!